Ballots Hit the Mail Today: Start 2014 with a Win! 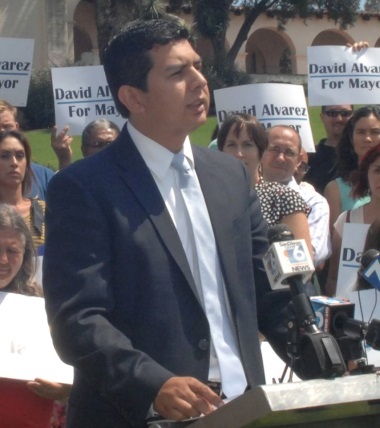 With the backing of the Democratic Party and a broad coalition of supporters, Councilmember David Alvarez is within striking distance of becoming the city’s next mayor. David has progressive values, a detailed plan, and a strong organization on the ground. But he needs our help to reach out to voters and turn them out for the Februrary 11 election, and early voting starts this week. Please sign up for a volunteer shift now! Precinct walking and phonebanking kicks off each Saturday morning at 9:30. On Sunday, walks start at 12:00 noon and phoning start at 2:00 p.m., and during the week, walks are held from 1:00 to 5:00 p.m. and phoning from 3:30 to 8:00 p.m. The campaign office is at 8316 Clairemont Mesa Blvd., Suite 205, in San Diego (92111). Just click here or call (619) 402-1330 to let them know when you can help. Can’t make it into the office? You can phonebank from home! Just go to www.sddemocrats.org/phonebank to get started. Whether you make 5 calls, 50, or more, your effort will help mobilize Democrats and elect David Alvarez next month.